As one approached Boston Terminal (South Station) from the South on the former Old Colony Mainline, all inbound &amp; outbound trains had to cross one of the 3 Rolling Lift Bridges that spanned the South Bay Channel. These bridges, which took 2 years to build carried untold amount of passengers & trains during their 87 year lifetime. The driving force to build Boston Terminal (South Station's Real Name) back in 1894 required the co-operation & consolidation of 4 Railroads: The New England Railroad (NY&NE), The Boston & Providence Railroad (B&P), the Old Colony Railroad (OCRR), and the Boston & Albany Railroad (B&A) to all share 1 common railroad terminal instead of being spread out all over Boston. In order to do this, the planners needed to accommodate the approach tracks for these 4 railroads & funnel them all into the South Station yards & platforms. The site chosen for the new station was approximately where the New York & New England Railroad station was located at the time. This site was chosen as the best location in terms of passenger flow & most importantly - land to build such a large facility that could handle the traffic from 4 competing railroads. The Old Colony Station which terminated just south of the NY&NE station would be be demolished as the new station yard tracks & approaches would be located where the OCRR station stood. Consolidating the B&P and the B&A railroad tracks was fairly simple since both railroads met several miles west of the site of the new station (The B&P crossed the B&A main line in Back Bay & then terminated at their station in Park Square). The Boston & Albany tracks continued to their station which was located next door to the OCRR station. Extending the tracks into the new Boston Terminal was easy for these two lines. Each railroad would extend their own tracks parallel to each other until they reached Boston Terminal property where they would merge into the Boston Terminal complex. Moving the tracks for the OCRR & NY&NE would prove to be a much more difficult affair. For the NY&NE, the tracks crossed Fort Point Channel from the east where the present Summer St. crosses the same channel. The Old Colony came from the South & crossed Fort Point Channel via a conventional lift bridge. The tracks for both railroads crossed about a mile to the south so it would be fairly easy to shift the right-of-way for the NY&NE to parallel the Old Colony until it reached the Fort Point Channel. The Old Colony Bridge that crossed the channel was too small to accommodate the increase in traffic from 2 railroads. Because of the lack of capacity of the OCRR bridge, All traffic for the NY&NE would be shifted to the B&P terminal for the duration of construction. It was obvious that in order to handle all the forthcoming traffic, a New Bridge would be needed to replace the existing OCRR bridge. One of the biggest problems facing the the Boston Terminal project is how to allow up to 6 tracks to cross the Fort Point Channel & still have sufficient clearance for shipping to pass safely. 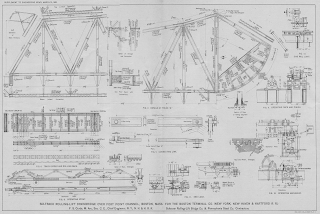 Many bridge designs such as horizontal swing, center-pivot swing, or fixed trunnion bascules were ruled by the railroads to be impractical, did not provide enough lift to clear traffic, or simply took up too much precious real estate to allow the 6 parallel tracks to cross the channel. 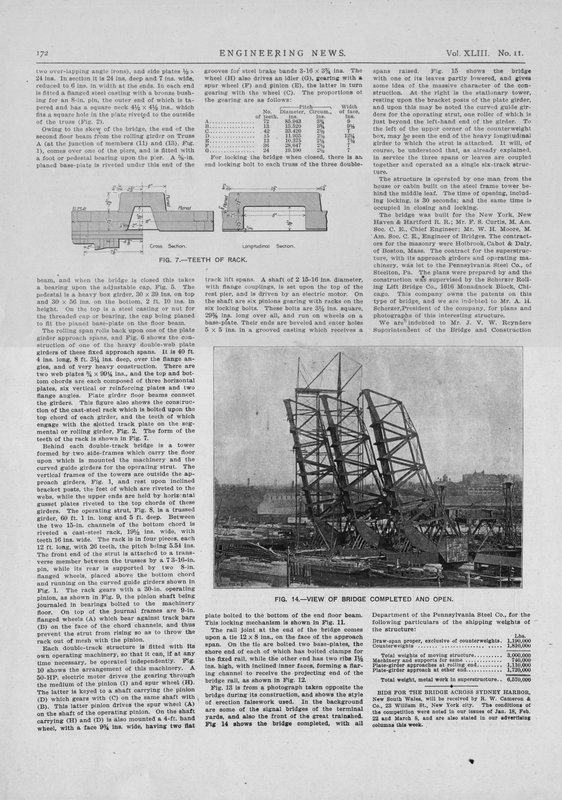 It was decided that a new bridge type - the Rolling Lift Bridge design provided the best solution to the problem. Enter William Scherzer & the Scherzer Rolling Lift Bridge. 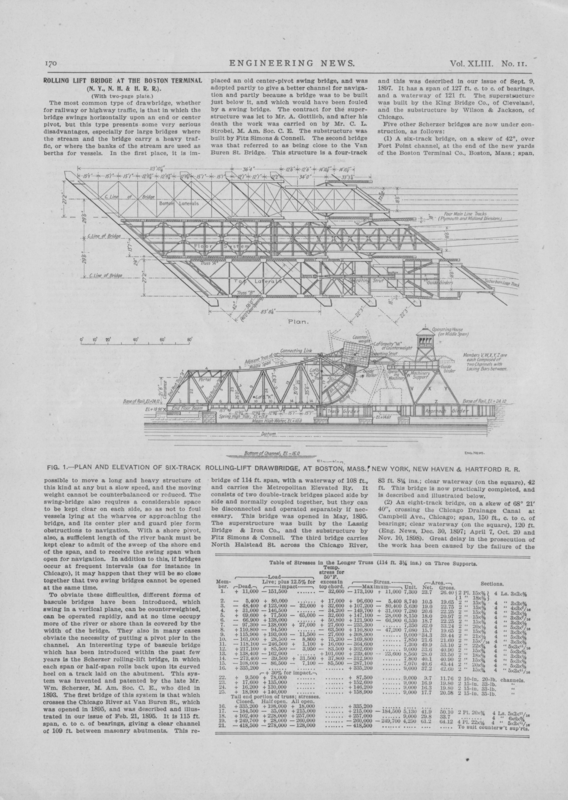 William Scherzer created the idea for the Rolling Lift Bridge in 1893. This type of bridge is unique in that each span or half-span of the bridge rolls back upon its curved heel on a track laid in its abutment. The bridge span can be rotated upwards to almost 90 degrees which allows just about any type of traffic to pass under it without ever harming the bridge. 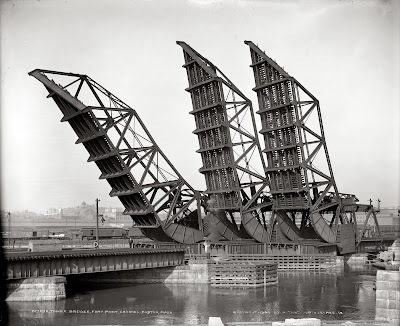 The first Scherzer Rolling Lift Bridge was built in 1895 to span the Chicago River at Van Buren Street. The bridge was 115ft long and carried street traffic. Scherzer designed & built 5 more bridges to cross the Chicago river as the design proved extremely successful. 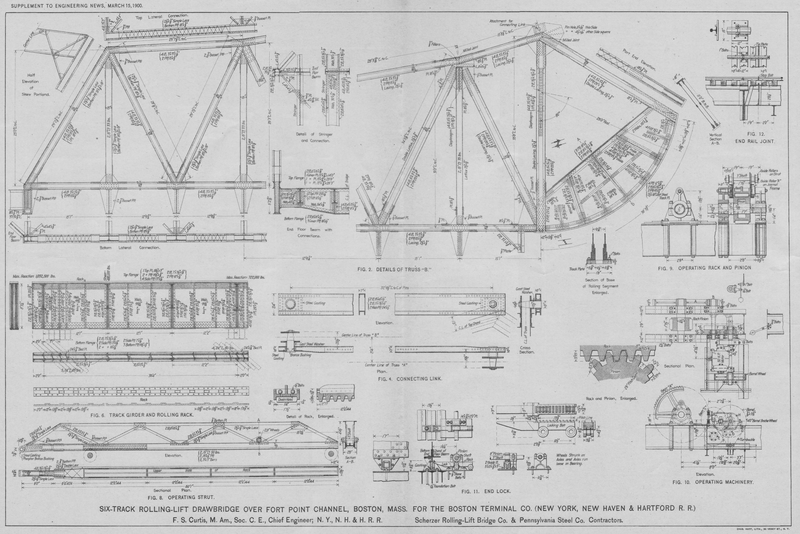 The contract to design & supervise the construction of the new bridge was awarded to the Scherzer Rolling Lift Bridge Company of Chicago. The contract for the superstructure with its approach girders & operating machinery was awarded to the Pennsylvania Steel Co. of Steelton, PA. The contract for the supporting masonry was awarded to the Holbrook, Cabot & Daly company of Boston Ma. Plans were drawn-up for 3 Rolling Lift Bridges to cross the Fort Point Channel next to the Old Colony right-of-way. 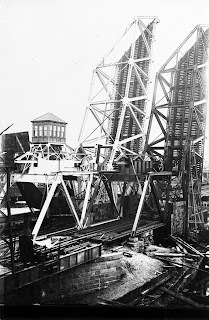 The interchange bridge for the B&P located just west of the OCRR would remain in-place to handle interchange traffic for the B&P & OCRR (this bridge was finally removed in 1910). Once the new bridges were completed & in-service, the earlier Old Colony Bridge would be dismantled. The lifting spans of the bridges had to be built in the vertical position so their construction would not impede boat traffic. It took 2 years 1898-1900 to complete all three spans. The lifting spans of the new bridges 83' 81/4" in length & cross the channel at a 42 degree angle. Each of the 3 bridges could be independently operated as each bridge contained its own machinery to raise or lower the span. The spans are very well balanced - so much that each span only required a 50hp electric motor to allow the bridge to operate. A control room was erected over the center bridge that contained the controls to operate all of the bridges. It takes only 30 seconds to raise or lower the bridges - this includes the time to lock the bridge in-place either up or down. The plans called for construction of 3 Rolling lift bridges located next to each other to serve the station. 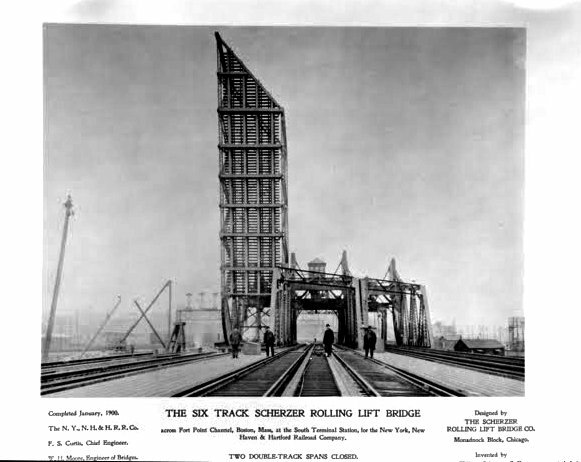 Each bridge would carry 2 tracks each - The western most bridge would carry the New York & New England tracks. The middle bridge would carry the Old Colony tracks. The eastern most bridge would provide service to the Suburban Loop track that ran under the station & the East Yard which provided freight service for the mechanical facilities of the new station. Before the bridges & South Station were completed, the New Haven Railroad leased the B&P, NY&NE, and Old Colony Railroads. The New Haven RR quickly absorbed them all into the New Haven Railroad System. When the station was conceived back in 1895 - there were 4 railroads coming to the new station. By the time it was completed in 1898 - there were only 2 left: The New Haven and the Boston & Albany Railroad. During the first 20 years the Bridges were operated extensively while also handling anywhere from 500-900 trains per day crossing back and forth across the bridges. At their peak - around 1910 -1918, all three bridges were raised & lowered no less than 24 times per day. The only bridge that was under utilized by railroad traffic was the easternmost span. The original plan called for this span to be used to handle the Suburban Loop which was planned to be electrified using center third rail. During the early 1890s, this technology was extensively tested on the Nantasket Trolley branch. However, by the time the Station was finished, newer & much safer technologies for electric trains were invented & center third rail technology was abandoned. The Suburban loop could not be converted for normal Steam Locomotive traffic as the air blowers installed in the loop were no where near adequate for these types of locomotives. The other problem with the loop was that it lacked sufficient vertical clearance to handle normal passenger cars & locomotives. With the cancellation of electrification & loss of the expected traffic, the easternmost bridge span was only used to bring coal for the station's electric plant & the occasional freight traffic to the terminal. After WWI, boat traffic navigating the Fort Point Channel declined as the South Bay was slowly being filled in. Dry Land was far more in demand in Boston - especially for the New Haven Railroad who needed yard trackage to handle the enormous amount of passenger traffic. By the time WWII rolled around, there was very little traffic navigating the channel. When the City of Boston rebuilt the Dorchester street bridge in 1948, they decided to install a fixed span across the Fort Point Channel instead of a moving bridge. This signaled the end of boat traffic for the Channel. At the same time, Boston Terminal, which operated the bridges, decided to weld the bridge locks to the bridge spans to prevent the bridge from accidentally lifting on its own. The bridges would never move again. By the early 1950s, the Mechanical Facilities (electric & ice facilities) at the station were shut down as the Boston Terminal Company could simply buy electricity from local sources which was cheaper than operating their own plant. With the expansion of mechanical air conditioning for passenger cars, the Ice plant was no longer needed. Since the easternmost span was used to service these facilities, this span was retired & the tracks removed at the same time the mechanical facilities were shut down. With the end of passenger service on the Old Colony division in 1959, the center span was taken out of service as it too was no-longer needed. By the time of the end of the New Haven Railroad in 1968, passenger service was so bad that only 1 bridge (carrying 2 tracks) was in-service. The End of the Bridges. Although all three bridges remained in-place, only one remained in-service; quietly soldering on carrying Amtrak passengers for many years. When Boston Terminal was renovated from 1984-1988, the bridges were finally removed completely & replaced with a fixed structure. This structure still spanned the remains of the Fort Point Channel. The trackage that crossed this bridge were expanded to 4 tracks in anticipation of traffic from the to be restored Old Colony commuter service - the same service that was abandoned back in 1959. Ironically, with the new fixed span bridge, the old bridge that once carried interchange service from the Boston & Providence Railroad to the Old Colony Railroad was restored in pretty much the same location where it was removed in 1910. What was once old is new again. With rail service on the MBTA expanding every year, South Station is once again approaching service levels it had not seen since its heyday back in the early 20th century. The current plans - as of 2011 call for the U.S. Post Office to leave the facilities that were built over station tracks 21 - 28 back in 1934. These buildings will be torn-down to make way for expansion of South Station from the current 13 tracks up to 21 tracks: just 7 shy of the original construction. Service on the final Old Colony branches - the New Bedford Branch & the Fall River Branch are scheduled to be restored in 2016. Service to Providence & T.F. Green airport are scheduled to be expanded as more people are moving to riding the rails instead of fighting traffic on the local highways. When the bridges were torn-down the 1980s, plans were created to preserve the memory of the bridges that kept traffic moving for over 85 years. If you are coming to South Station on any of the Old Colony tracks, look to the right as the train is crossing the remains of Fort Point Channel. There you will see, painted bright red is a piece of the original bridge - still watching passengers cross the channel. Data for the Scherzer Rolling Lift Bridges. 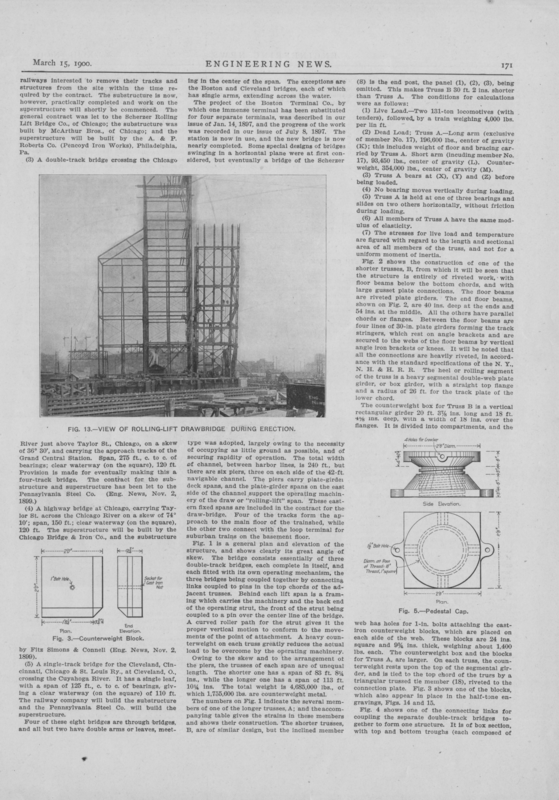 This is a scan of the 1900 Engineering News article that describes the Bridges, history, and a set of detailed plans of the bridges.These are digitized copies of the original article I found though a dealer.